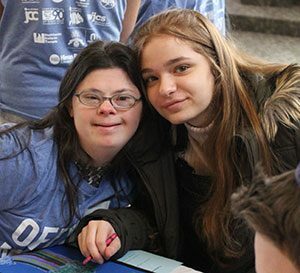 Yachad, the National Jewish Council for Disabilities under the auspices of the Orthodox Union (OU), is kicking off North American Inclusion Month (NAIM) with more than 250 events taking place around the United States and Canada. Programs are aimed to provide social opportunity in addition to developing sensitivity and awareness of what it means to live with disabilities, and to educate communities on how they can do their part to make sure all Jews are included in all facets of life. A new addition to this year’s programming for NAIM is the “28 Days of Inclusion Challenge,” a special social media program offering daily tips and strategies for shaping a more inclusive world. Yachad has debuted a new calendar for the month with daily challenges. Each day, participants visit the NAIM webpage to learn more about an aspect of inclusion. As participants complete the day’s challenge, they are entered into a raffle to win prizes. The website will update daily with new tips and challenges. Programming will take place in Baltimore, MD; Chicago, IL; Cleveland, OH; Dallas, TX, Los Angeles, CA; South Florida, New England, New Jersey, New York and Toronto. In addition to the many Yachad programs going on throughout the country, several departments within the OU are partnering with Yachad on special events during the month of February. NCSY will be offering Yachad’s sensitivity training workshops to their Jewish Student Union clubs on 180 public and private high school campuses. OU-JLIC educators will be facilitating learning programs about disabilities and inclusion on more than 20 college campuses. Synagogue Services will be sending out inclusion tips and talking points for Rabbis to use in sermons to their Shul memberships. Other divisions, such as OU Torah, Teach Coalition and Heart to Heart are collaborating with Yachad to promote inclusion throughout the month. Yachad services include, but are not limited to: social programming for all age groups; counseling services for individuals and families; weekend retreats; parent support services; sibling services; vocational training and job placement; professional advocates and case managers; summer programs and camps for members of all ages; schools for individuals with special needs; Shabbat programs; Day Habilitation programs; Israel Birthright trips individuals with disabilities; social skills training; advocating for pro-disability legislation on the local, state, and federal levels; and high school and university leadership programs.